I love this scarf! 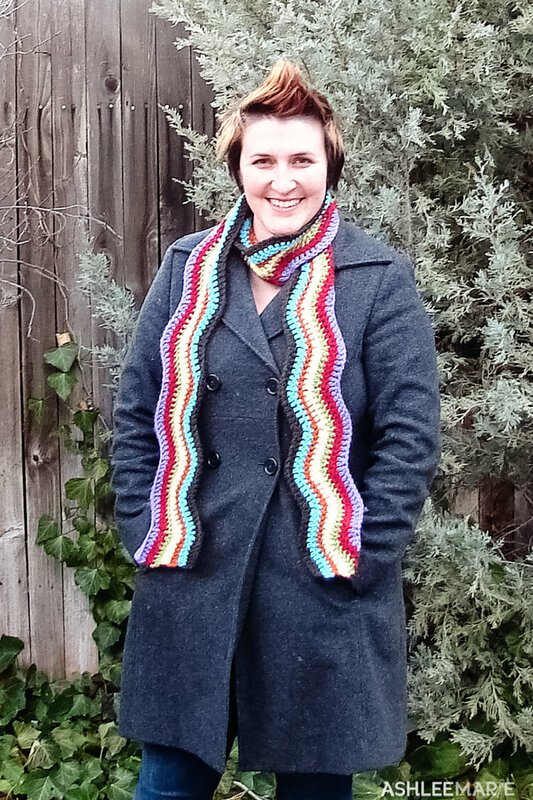 I was inspired by this 70’s inspired scarf, that I pinned back in November. I whipped out two the night before my Disco Abba Party and they were a hit! 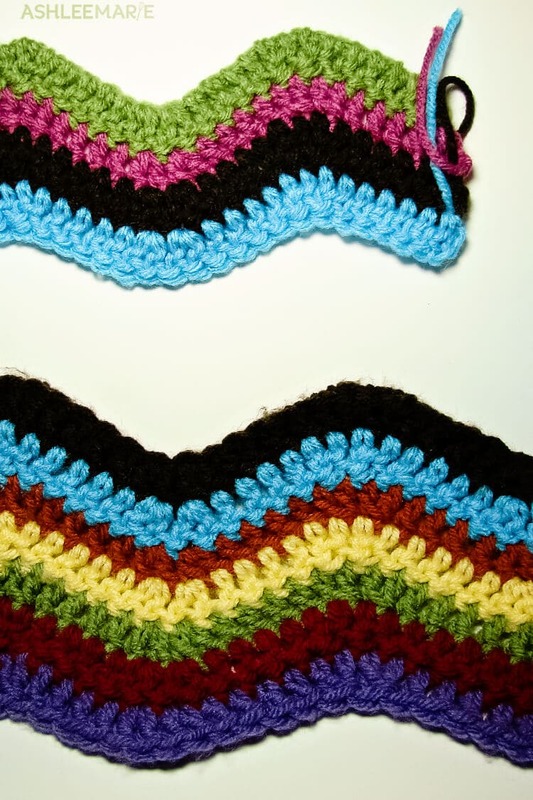 The crochet chevron patter is super simple and easy to adapt! My parents were given a full size chevron crochet blanket for their wedding that I still remember fondly! Row 1 – dc in 3rd chain from hook (first 2 ch count as first dc here and throughout) dc in next 4 ch, dc2tog in next ch *dc2tog in next ch, dc in next 4 ch, 2dc in next 2 ch, dc in next 4 ch, dc2tog in next ch* repeat between ** across to the last 7 ch, dc in next 4 ch, dc2tog in next 2 ch, finish off and cut yarn with a long tail. Row 2-7 -change color- sl st in first stitch, ch 2, dc in the same stitch as the sl st, dc in next 4 stitches, dc2tog in next stitch, *dc2tog in next stitch, dc in next 4 stitches, 2dc in next 2 stitches, dc in next 4 stitches, dc2tog in next stitch* repeat between ** across to the last 7 stitches, dc in next 4 stitches, dc2tog in next 2 stitches, finish off and cut yarn with a long tail. dc in next 4 stitches, and dc2tog* repeat between ** across the ch or row until you get to last 7 stitches. End with dc2tog, dc in 4 stitches and 2dc in the last stitch finish off every color for every row! I did the tutorial piece with an I-5.5 hook, but the actual scarf with a K-6.5 hook. You can see the difference. Feel free to use any hook you want to get the look you desire! Also you can use any yarn you have, mine are all left overs from other projects, with even slightly different brands and weights and feels and it looks just fine. You can choose to start on the same side every time or go back and forth as if you were working with the same yarn and turning at the ends of the rows. I did the turning, but wish I had started on the same side every time, I think it would have made the rows more even. See how the green and orange rows look thinner? It’s because these are the “wrong” side while the red, yellow and blue are the “right” side! Thanks! I think I need a few more in some other color schemes! Such a fun scarf! I love the colors! I’m so glad that you agreed to be a part of POV! Thanks so much! I’m SO happy to be a part of the group! Awesome scarf, Ashlee! I love the chevron zig-zaggy look of it. Great color, too! Thanks! 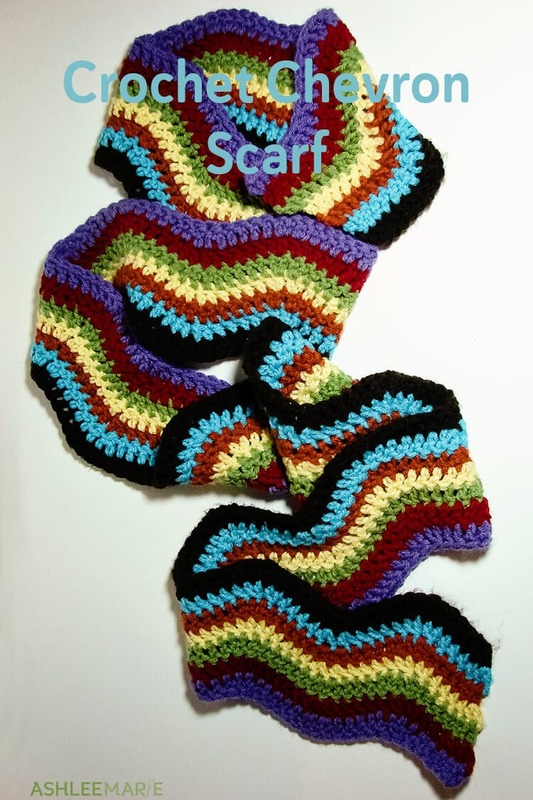 I’m kind of wishing I’d just done a full scarf in the tutorial colors, looking at the pictures I’m loving how it turned out as well as the rainbow one! I love it! 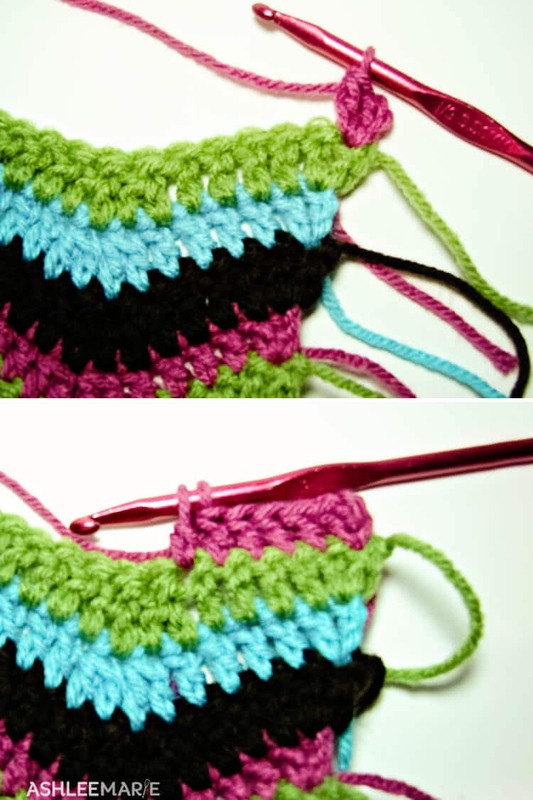 The zigzig is one of my favorite patterns to crochet (you know, the once I actually sat down and did it 🙂 because it is easy to remember and not so easy to mess up 🙂 Great job! I love it too, and it’s so fast! Not like some of the more complicated patterns! did you mean on row one dc in third ch from hook AND IN EACH CHAIN TO END? cozy and cute… perfect combo! Thanks!!! I love the chevron print, although not on EVERYTHING! I adore this scarf. I need to learn how to crochet! I’m just starting to knit, but that will be next! 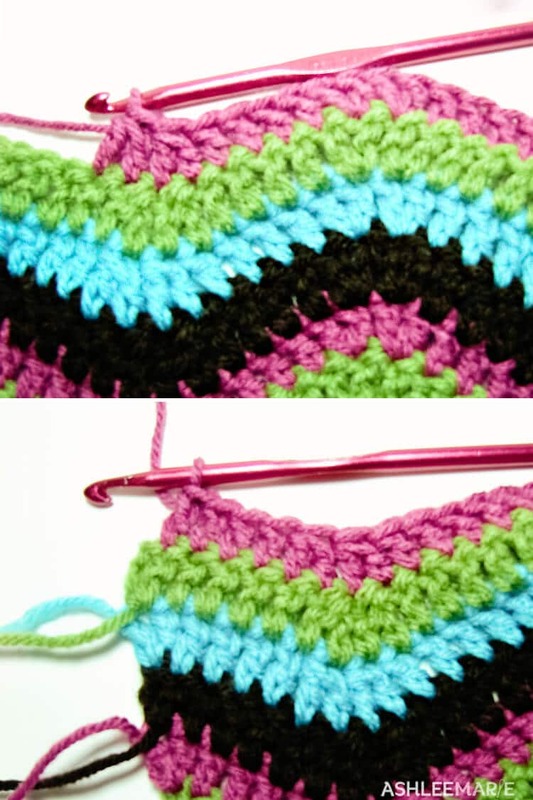 Crochet is actually much faster and even easier than knitting in some ways! Good luck. Thanks! It was super fun, I think I want to try it again in a few different colors! I can’t wait to make this scarf! I love finding fun ways to use scraps – what a beautiful project! Thank you! it’s a really fun one! and super fast, I just broke mine out for the year! At the end of the quote above where it says “2dc in next to stitches” — Do you mean 2dc in next two stitches ? Or do you mean next to stitches like going on to the next stitches? That part is confusing me. it should say two, I fixed it, thanks! are you just weaving in the ends of each color when you are done? I’m not sure why you show them long and left after each round? I already finished the scarf when I decided to do a tutorial, so I just threw together an example, it’s actually not much longer than you see in the pictures. And for the real scarf I like to do things one at a time, so I did the full scarf first then weaved in all the ends at once, rather than crochet, weave, crochet, weave, I think it goes faster that way. But it’s just personal preference. Which would make it begin and end with dc2tog, more “valleys than peaks. Your pattern also states that you should work 4 dc between the last dc2tog of the repeat and the final one, which would make an odd downward curve. Also, 4 dc and a dc2tog only adds up to 6 stitches not 7, is there something missing? If I have read this incorrectly please let me know. the dc2tog make ONE stich – the 4 dc make 4, then the 2dc in on sitch make 2 – so 1 plus 4 plus 2 is 7 – on the other side it starts with the 2dc in one, then the 4, then the dc2tog – so again 2 plus 4 plus 1 equals 7 – you can end with whichever set of 7 you want.